Most of Israel’s western border is the Mediterranean Sea. Throughout the centuries, some cities that were small ports grew into large and urban centers with rich culture. Nowadays, they are popular tourist destinations that offer many unique sites and lots of leisure activities. These port cities play an important role for the country’s economy. Apart from bordering with the Mediterranean Sea, the south of the country borders with the Red Sea. Eilat, the major southern port and the only Israeli city on the Red Sea, developed into a beautiful resort and one of the major tourist attractions. Other port cities like Jaffa, Tel Aviv, Caesarea, Akko, and Ashdod, buzz with tourists, and have various landmarks of historical and cultural significance. If you are planning a vacation in Israel, here are the top port cities worth visiting. Eilat was built on the ancient town of Elath that had one of the earliest ports in Israel. It is believed that Moses and the Israelite people passed through the area as they avoided the land of Edom while travelling to the area east of the Jordan River. Eilat is significant for its export and import to and from East Africa and Asia. It also plays an important role in tourism; in the late 1940s, it transformed into a beautiful resort city offering various possibilities to its visitors. Once in Eilat, one cannot miss a chance to visit the Underwater Observatory, explore the beauties of the Dolphin Reef and marine life; its beautiful beaches always buzz with the tourists, as well as local people. For those looking for adventure and more activities, scuba diving and snorkeling to see the incredible coral reef will give an unforgettable experience. The city of Haifa is located on Mount Carmel, facing the Mediterranean Sea. 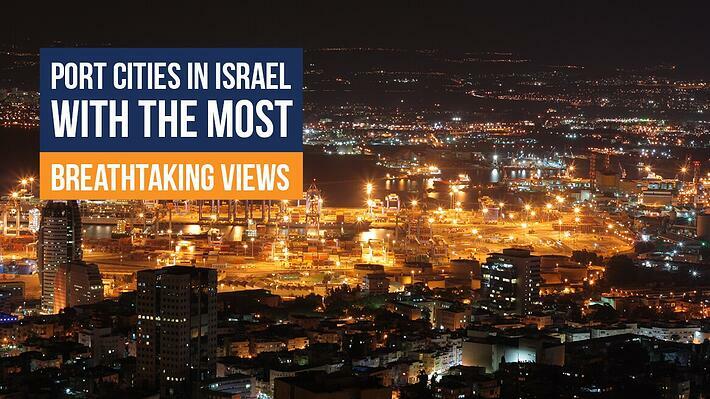 It is a northern Israeli port and the third largest city in Israel. Haifa stands out for its cultural diversity; it is a fusion of Jewish and Arabic cultures. One can witness the cultural diversity on every corner of the city and enjoy the peaceful coexistence of its population. The terrain and the view from Mount Carmel are stunning. The city’s jewel is Bah’ai Gardens, a UNESCO World Heritage Site. It is a pilgrimage place of the Bah'ai faith members. Bah’ai Gardens is divided into three parts: the German Colony, gardens around the shrine, and Louis Promenade. The Bah’ai Gardens have nine concentric circles with small trees and sculptures, flowers, pools and water fountains. Another place that is a must see in Haifa is Hof Hacarmel, the coastal area with stunning beaches. Every year, thousands of visitors enjoy swimming, sunbathing, and fishing. Adventurers can enjoy water sports, such as parasailing, kitesurfing and surfing. Caesarea is an ancient Herodian port city located on the Mediterranean Coast. It is a city well known for its national park with its ancient harbor ruins, archaeological sites and beautiful beaches. After restoration, it became one of the most famous and the most attractive archaeological sites in Israel. Caesarea offers a lot to its tourists. The Caesarea Aqueduct Beach is one of the best beaches in Israel; there is an ancient aqueduct on the edge of the beach, offering a breathtaking view. Another site worth visiting is the Caesarea National Park, an archeological site with a harbor built by King Herod. The Caesarea Amphitheater is a part of the park where many concerts are held during summer. Within the park, one must visit the underwater museum, where people can dive through the underwater ruins of the ancient city. Another ancient port city, Jaffa, is thought to be the port from which Jonah left in the story of the Whale. The town served as the main entry point when Jews from around the world began to return to Israel. Jaffa is a vibrant, multi ethnic community of Muslims, Christians and Jews, all coexisting peacefully and contributing to the city’s diversity with its cultures and traditions. The beautiful city of Tel Aviv has grown from this place. When visiting Jaffa, there are lots of things one can do: explore unique shops and boutiques on the small and narrow streets, see the remnants of old shops and houses of worship, enjoy local food in cafes and restaurants, and check the renovated seaport. The seaport is not only used by fishermen, but it’s also teeming with life and culture. The largest port in Israel is located in its sixth largest city, Ashdod. Ashdod is one of the oldest cities in the world; the remains of Canaanite culture were found at this place. It is believed that the Canaanite culture settled in the area in the 17th century BCE. Many tourists come to Ashdod to explore its rich history and the remains of the ancient settlements on its coastal area. Tourists enjoy and explore the archeological site of Ashdod- Yam, the ruins of the lighthouse and castles. Ashdod Sea Fortress and sand dunes leave tourists stunned. Visitors enjoy the spectacular beauty of the musical fountain in the Ashdod- Yam Park.